Considering that I've been working within easy walking distance of Sweet Leaf in Long Island City for a year and a half, it's kind of surprising I've never made it there before Thursday of this week. 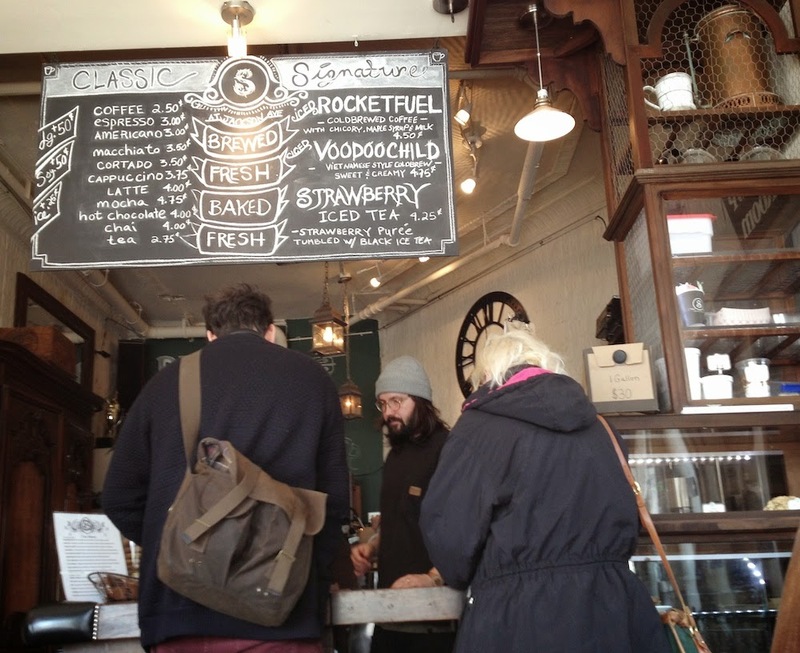 Or maybe not so surprising - I had the idea that they were some kind of indie, tea-centric Starbucks wanna-bes. I was wrong on all counts. For starters, they have a lousy selection of real teas, and by real I mean black tea. They had exactly two, Earl Grey and something else. I got the Earl Grey. But also they're not so much like Starbucks as some college-town hang-out, all funky and unique, much like Java Joes in Athens Georgia (my daughter and I made a pilgrimage there on a road trip to Key West - almost 20 years ago) and the one in Montreal in 2005, although I forget the name of that one. These people aren't into REM though - they're into Heavy Metal. 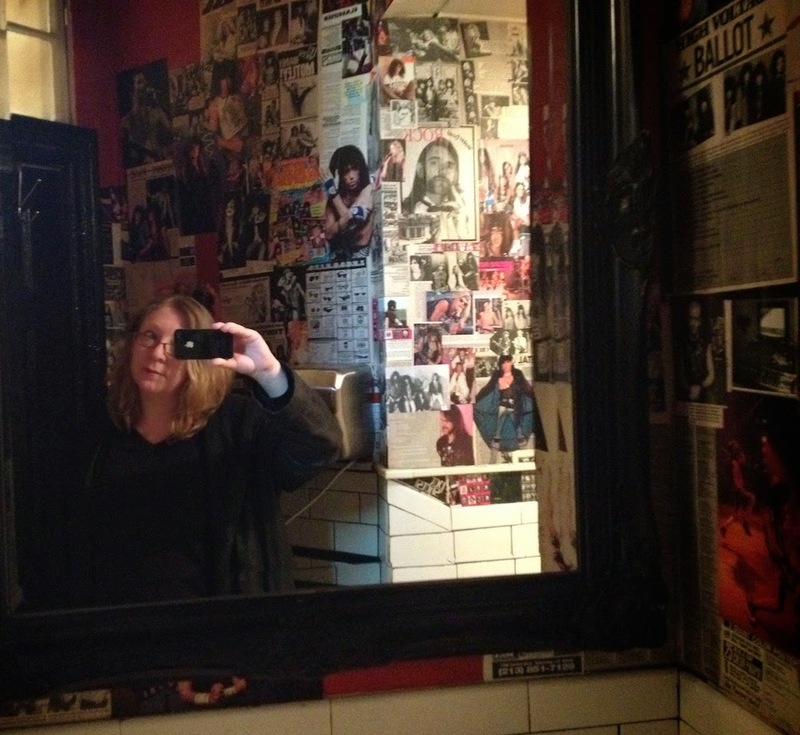 The bathroom is plastered with magazine clippings of all the biggest hair bands, as you can see in the photo above. 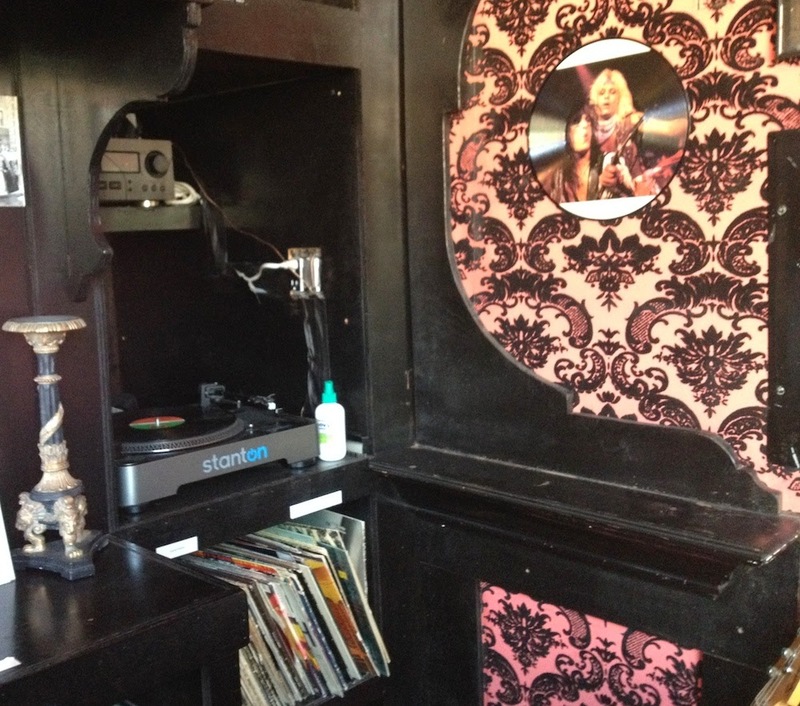 One of the features of Sweet Leaf is their "Record Room" which is a small section in the back that has an olde tyme turn-table and vinyl albums. And while their record selection is eclectic (at a quick glance I saw Neil Diamond and show tunes) what they really like is, as I said, heavy metal - more hair band clippings on the wall. You can see members of Van Halen in the photo on the right. When I was there though, I didn't hear heavy metal - according to my Shazam app they were playing tunes by Crystal Castles, which certainly didn't sound metal, and which according to Wiki is "an experimental electronic band" from Canada. I heard their tunes "Not in Love" and "Pap Smear." "Runnin with the Devil" it ain't. The guy at the counter looked like Jerry Garcia's brother, not a metal head or an electronica fan, but then, maybe the rules of couture are different now. Seeing all that homage to heavy metal in a tea shop was very odd - I didn't know if they were trying to be ironic or what. And then it occurred to me - although I remember the days of metal, when Led Zeppelin bestrode the earth and Alice Cooper was terrorizing parents and charming adolescents with his Halloween haunted house theatrics and his name (he goes, inexplicably, by a girl's name - is there no taboo he won't break?!) the people who run Sweet Leaf probably look at it through the more recent eras of Emo and Goth and think that it's all so utterly harmless and even quaint.